The planet Mercury will soon be at its best for skywatchers on Earth. 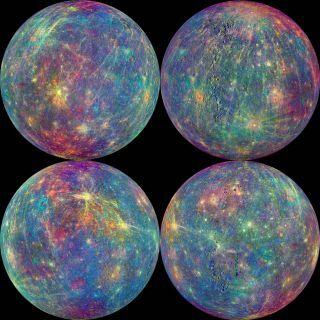 These views, based on data from NASA's MESSENGER spacecraft, show the planet's surface in stunning detail. We have just entered a very favorable period for observing the so-called "elusive" planet Mercury. From now, until about May 13, you should be able to find it with not much difficulty. But how well do you know the closest planet to the sun? Weather permitting, Mercury is currently visible as a bright "star" appearing low in the west-northwest sky about 45 minutes after sunset. In fact, during the first 10 days of May, Mercury will set after the end of evening twilight in a dark sky, nearly two hours after the sun has gone down. Mercury has the most eccentric orbit of all the planets, and therefore when it is closest to the sun, its orbital speed is appreciably greater than at other points along its orbit. In fact, if Mercury always moved with the same angular velocity that it has at perihelion, it would take only 56.6 days to orbit the sun. This is less than Mercury's rotation period of 58.65 days, which of course is the same wherever this planet is in its orbit. About four days before Mercury passes through its perihelion point, its orbital motion around the sun just equals its rotation rate. At this point, as seen from Mercury, the sun's normal east-to-west path across the sky ceases and appears to reverse its course in the sky and begins to drift back toward the east. While passing perihelion, Mercury revolves around the sun faster than it rotates on its axis, unlike the normal situation for the other seven classical planets of our solar system. The sun appears to continue moving backward until four days after perihelion, when the rotation period overtakes the revolution rate. This phenomenon can create bizarre effects. A hypothetical astronaut standing on Mercury several days before perihelion passage could watch the sun — about three times larger in size than it appears from here on Earth — slowly rise until more than half of it was above the eastern horizon. The sun would then appear to completely set below the same horizon, but then would soon rise again and gradually accelerate across the sky, finally setting in the west! Mercury has been known since at least the time of the Sumerians (3rd millennium BC) where it was often associated with Nabu, the god of writing. Because it is the closest planet to the sun, from our Earthly perspective Mercury appears to shift back-and-forth rather rapidly from one side of the sun to the other. In Roman mythology, Mercury is the god of commerce, travel and thievery, the Roman counterpart of the Greek god Hermes, the messenger of the Gods. The planet probably received this name because it moves so quickly across the sky. The ancient Greeks actually thought that Mercury was two planets, and they called it Apollo when it was visible in the morning sky, and Hermes when it was seen after sunset. But in the 4th century BCE, ancient astronomers realized that the two objects were one and the same, and stuck with Hermes; becoming Mercury with the Romans. Nicolaus Copernicus (1473–1543) is generally credited as the man who removed the Earth from the center of our solar system and replaced it with the sun. His theory was published in "Dē revolutionibus orbium coelestium" ("On the Revolutions of the Celestial Spheres"), in the year of his death, 1543, though he had formulated the theory several decades earlier. And yet, for all of his 70 years, a view of Mercury seemingly eluded Copernicus. The combination of Mercury's low altitude and close proximity to the sun combined with the perpetual misty sky conditions of his native homeland of Poland, precluded a view of Mercury for the man who forever changed man's view of the configuration of the solar system. Editor's note: If you snap a great photo of Mercury that you'd like to share for a possible story or gallery, send images and comments in to: spacephotos@space.com.